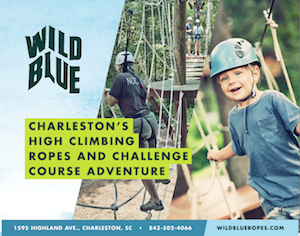 Wild Blue Ropes, a high adventure ropes and challenge course, will be opening this May on James Island. Owners, Gary Ladd, Hugh Corcoran and Ron Hite, are excited to show locals and visitors that the course is more than just a physical climbing experience. They want to share the message that there is an opportunity for individuals or groups to experience a sense of personal accomplishment while navigating the course’s elevated maze of ropes and obstacles. Wild Blue Ropes offers four different course levels to accommodate any type of skill level and showcases 22 tower poles and over 70 course elements. Visitors can walk across steps that hover 25 feet above the ground, climb ladders to higher heights and navigate suspended bridges. Located on Charleston, South Carolina’s James Island, Wild Blue is for those seeking the potential that exists past personal limits. Wild Blue Ropes is an aerial adventure ropes course designed under the standards of the Association for Challenge Course Technology (ACCT), with an emphasis on fun and excitement. Wild Blue Ropes is ideal for families, friends, youth groups, and corporate outings.